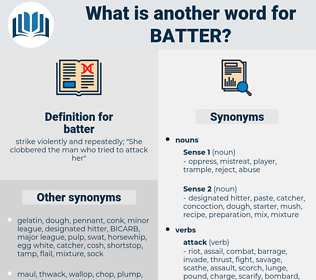 What is another word for batter? strike violently and repeatedly; " She clobbered the man who tried to attack her"
storms, upsets, swamps, jolts, rocks, Downs. hitter, batting, drummer, dough, paste, baseman. decorate, create, fix, cure, mend, repair, adorn, fail, help, praise, lose, beautify, ornament, restore, let go, assist, construct, encourage, aid, heal, compliment, build, protect, surrender. fall, go down, go under. When, later, it became necessary for the Prairie and Chester to fire just over their heads to batter the walls of that same War College, it made no difference. If one year does not make Little York surrender to us, then we'll batter it for two; and should it still hold out, we have ammunition for a much longer siege. bath water, bay tree, boudoir, Bo Tree, baby powder, be after, biter, betray, betrayer, body odor, bather, b battery, bed wetter, bawdry, buttery, bedder, bidder, body hair, bother, beater, bettor, bead tree, beta ray, Body Odour, bitter, boater, bee eater, by the hour, battery, butter, beefeater, better, bedwetter, bad weather. fritter batter, pouf paste, pate a choux, puff batter, pancake batter.